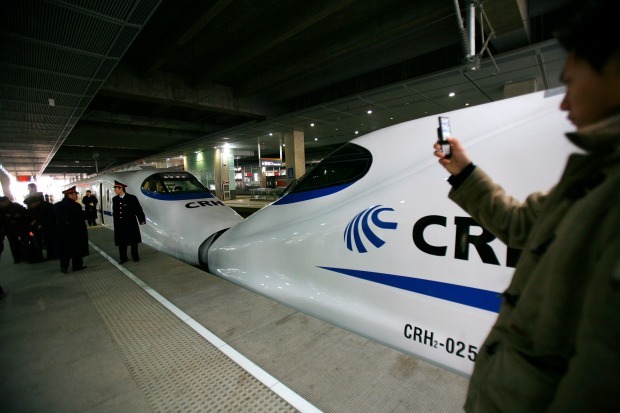 News item: China is slashing its spending on construction of nearly 4,000 new miles of track for high-speed rail. The savings will be about $40 billion a year. Reaction: why don't they send that money to California? The price tag for California's high-speed rail proposal -- $100 billion to build a first phase that connects LA and San Francisco over the next 23 years -- seems very high. Until you compare it to China. The country had budgeted to spend $110 billion just in 2012 in developing its system. Whcih begs the question about this modest proposal: might the Chinese be persuaded to fund California's system. Someone has to. One reason the California proposal seems unlikely to ever happen is the price tag. The other is the lack of a source of funds to pay for it. Existing state bonding authority and federal funds are less than 20 percent of the project. By back-of-the-envelope math, Caifornia needs some $80 billion -- or two years of China's savings on high-speed rail. Outlandish, yes? But no more outlandish than the notion, promoted by high-speed rail advocates, that the federal government and private investors will come up with these tens of billions for rail. The Chinese government is a more likely potential investor. China has a big stake in Cailfornia, a major trading partner. Some parts of Southern California are warehouse districts for Chinese goods. And the Chinese government might, for reasons of symbolism and national security, see value in owning a big piece of American infrastructure. Does anyone have a better funding idea?